Serves: Five as an appetizer, two as a main. Prep time: 5-10 minutes. Cook time: 6-7 minutes. Any whole fish, fried and breaded, (the smaller the better) is my fatty food of choice. Everyone has their version this – whether it’s cupcakes, caramel, ice cream or chips – fried fish with crispy skin, so crispy that the tail and even some or all of the bones are edible is my version. Yesterday, with kids in tow on the way back from school, I realised I didn’t have anything prepared for dinner and I needed to think of something quick, easy and hopefully kid-friendly. My kids were semi-excited about this, one of them just wanted to eat the skin, but it was a gamble and at least I enjoyed it! P.S I don’t care whether this dish is trendy or in-the-moment of health conscious Americans or even if you’re surprised that I’d ever post a dish like this, I’ve had a busy week and not only is this dish so easy to prepare and write about, did I mention that it’s really good as well? Directions: Rinse each piece of fish thoroughly under cold running water and drain well. Place the fish in a bowl and squeeze the lemon over the fish. Heat oil in a small heavy bottomed pot or frypan (you can choose to deep fry or to shallow fry, the only difference is in the amount of oil you use and whether you need to flip the fish. I personally shallow fry and flip, so that’s what I’ll share). While the oil is heating (please don’t leave unattended because if you do you will probably forget and then your house will burn down, so just don’t leave it) mix the flour and spices together in another bowl. 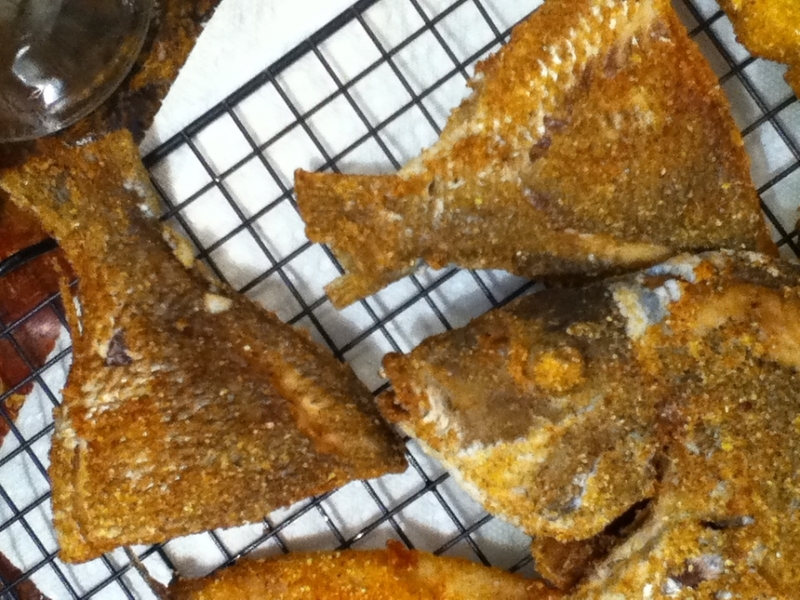 One at a time, coat each piece of fish with the flour mixture, then let it rest on a plate until all are done. Once the oil is very hot, add all of the fish to the fry pan, or as many as you can fit. Fry until browned, about three or four minutes, then flip using two forks and continue frying for another two or three minutes until those fish have turned into golden crispy goddesses. Drain well. Better eaten fresh and hot but still good cold the next day. Serve with tzatziki or a very lemony sauce. I always suggest buying your fish from a dedicated fish market and choosing each fish yourself. Look for something with bright clear eyes and blood red gills. Tell your fishmonger how you want your fish; whether cleaned, filleted, cut or whole they will do it all right there. It might take more time compared to buying pre-cut and filleted fish in a supermarket, but it makes a huge difference in freshness. Also, you can absolutely buy kosher fish from a general fish market even if it was right next to the catfish, swordfish, shrimp and calamari. The rule is that as long as you personally observe the simanin (fins and scales) and request the knives and board to be washed, (which would probably happen regardless) you’re in the clear. Here are two recipes I found for tzatziki: the first one is the quick and easy version but I prefer the second one, because it’s basically the exact same thing and there are images that show you how to turn your regular store bought or homemade yogurt into greek yogurt, simply by draining it.